Thanks a lot Danijel! I really appreciate the comment! I still have to print it out yet...LOL!! It definitely brings the smile to my face, Rob. Its just breath-taking. Its beautiful and it deserves the highest rating. Excellent shot Rob, Definitely one of my favorites. One amazing thing about this photo (since I got to see a print), is that it looks just as cool upside down, so if you would like download this photo and spin it.. Outstanding Rob!!! It sure does bring a smile on your face. Makes me wanna move rightaway to WY!!! vedere ancora le tue ottime foto e questa è anche con un doppio award!!! è così pulita, perfetta, il cielo in un perfetto contrasto polarizzato! perfetta e geometrica , vome il riflesso..
Well, Rob, let me be the thousandth person to say WOW!!! What an awesome image. Excellent 7+++ Congrats on the awards. Big smile ! One of the best landscapes I?ve seen so far. Well deserved awards. Congrats ! Awww Rob....thankyou. That means more to me than any award...thankyou so much. Judi...Great Compliment from You! My absolute favorite of yours is "Freedom of Mind" and if any of you, if any, haven't seen it...here is the link. I can see why it's your favorite..classic and beautiful! Yayayayay....I am so happy you got this award. Fantastic. Now what does Grace's mum (Will&Grace) tell her: told you so, told you so, told you, told you, told you so.....!!!! Stunner recognized!!!! Bravo!!!! What do I think!!!?? WOW! Awesome, stunning and amazing come to mind!! Compositionally perfect, colours and balance amazing! National Geo quality!!! Top marks for this one Rob! Congrats on the SC & BIP too! Should have been EC, SC & BIP though. Awesome landscape, like the reflection off the water & the saturated colors. Well done Rob & warm congrats for the twin awards, best wishes. Your welcome for the support...just call them like I see them; great work! Secondly...thanks for that...a lot! I was really happy when I got home last night to find the awards sitting in my in box...what a feeling! Helps to validate that perhaps we are all going in the right direction when our peers recognize the work submitted. I can only imagine what your work will be like then Toshi! Non-DSLR's can be excellent...obviously You and so many others prove that, but there is a great deal of control over the DSLR and it just feels right using one! Changes your mindset believe it or not...LOL. Thanks Again! it is no surprise that this one won an award! kudos to you Rob! WOW ... stunning colours/reflections! The clouds cooperate perfectly with you here. A breathtaking sight ... congrats on the well deserved awards, Rob! Wow, this is amazing Rob! Definately not a surprise you got awards for this shot. Perfect landscape capture and excellent reflection - the colors are amazing and those clouds look unreal! This is so stunning! And I really like the low clouds in this too, they seem quite a special addition. The low clouds and reflections are fabulous. The plants in the front make it feel like the viewer is standing there soaking in this marvelous view. Love it. Congratulations on SC and BIP! Simply stunning Rob the colour is wonderful & that reflection is great. Just had to come back and rate this - and put it in to my favorites! Hello Rob, First , thanks for the kind comment!!! I can see why this is one of Youir favorites!!! A perfect landscape! !This has it all!! COLOR. composition, reflection (stunning),It's just a pleasure to view and I will add it to My Favorites so I can look at it again and again!!! Thanks Petal!!!!!! It really did feel like the stars aligned that day...LOL. It was unreal to see it in person. Funny story about that day is that I almost got shot by a hunter on accident...probably missed me by about 3 feet/ 1 meter. Hunter was shooting at an Elk and the bullet went flying right by my head..
Wow Liz!!!!! The best one all week??? That is an amazing compliment!!!! THANKS!!!!! Wow Marky! 10+++ THANKS 10 times over! Thanks a great deal Ahmed!!! Lukasz...thanks for the compliment and the critique...I will have to try that and see how it feels. I really liked the grass in the foreground..I thought it gave depth to the pic. If I cut that out then those cool trees above it would have to go to...don't know if I could part with those... LOL. BTW...You shot you won the awards for are excellent! Moto Grazi!!!!! Thanks for the 7! Thanks John! Worthy of a calendar...NICE Compliment! No...THANK YOU for the great words! Wow Jason! Thanks! No I just have to figure out where... LOL! Thanks Mohamed! I am glad that you liked it! From ear to ear...!!!! What a stunning view!!! Beautiful colors, super reflection, excellent composition (putting that grass in the foreground adds tons of depth) and those clouds are such an amazing bonus.... talking about being at the right place at the right time.... well captured!!!! The best picture that I have seen this week Rob....stunning!!!!! Superb 10+++ .. cheers .. marky . wow....its beautiful. it certainly changes the mood. what a pleasant atmosphere, well captured. There are many sites you can go to where you can sell your images...either by print or by download....if you need to find some...let me know. A jolly good calendar shot Rob, wonderful sharp colours, well done. Superb!!! !What an amazing shot!! Really well seen! WOW! Thank you for posting, thank you for sharing... GREAT PLEASURE to see This BEAUTY! GREAT! PERFECT! SPLENDID! BEST!!!!!!!!!!!!! to my favorites, of course! THANK YOU once again! My best wishes and admiring... Alexey. Thanks Avi...now I have to look for where you are seeing him at. :) Clouds are cool for that kind of thing aren't they? Thanks Mike!!! Really appreciate that...a lot!! Rob Rob Rob OMG! This is a million dollar shot you need to take this to a gallery or something. This needs to be out there the audience here is just too small. Thank you so much for posting this it is what makes usefilm the best site. Thanks for finally sharing this photo with us. What a beautiful landscape. The clouds down low under the mountains is something you rarely see in photographs. The waters surface looks like smooth glass and the reflection in the water makes the image simply stunning. The dried grass in the foreground makes for a great composition. I only gave you a 7 on this one. 100 isn't listed. Stunning crisp colours, and I must say perfectly composed...see you never needed my input. But robbie, you are so horrible at choosing the project...this is a 'classic landscape'. I should'nt tell you since now you'll get an award in the more appropriate project, and catch up to me!! hahaha! what a Beautiful composition Rob , Excellent colors & reflections , regards . Stunning!!! This image would sell really well. Ameed...THANKS...I really love this one a lot! It is my favorite...don't get me wrong...I like some of my other ones...but overall this one just does something for me. :) Thanks Again!!! Wow Magnus...now that is one heck of a compliment...like something out of the movies where you here things like that! :) Thanks for the great Compliment! You really do like it Kel? I am glad, because you know how much I just love your work! :) Thanks Kel...always wonder how people will react. Hi Yamil...Thanks! This is in Jackson Hole, Wyoming. 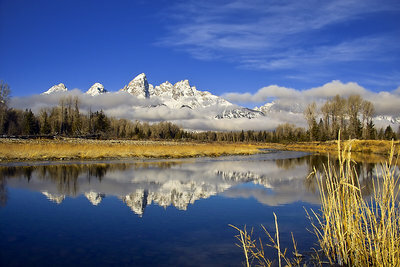 It is called Teton National Park and is about 30 miles south of Yellowstone National Park. Two natural wonders of the world so very close together is mind blowing. Thanks for looking! The colors and tones are amazing. Oh my goodness! This is amazing! This is so crisp and focused. The colors are wonderful. Great job Rob. Thanks for sharing this treasure.